Data Collection System NOW Integrated into VESTA! VESTA is moving to a fully integrated data collection system incorporated into VESTA’s operation! Vision Metering’s goal is to allow customers to eliminate third party data collection systems by developing VESTA into a system that answers all of a user’s needs. VESTA test boards can be networked together or networked into other systems. Due to the computing power inside, VESTA lends itself perfectly to being an all-inclusive system for a user. 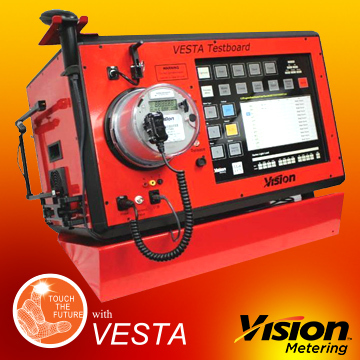 At Vision Metering’s meter shop, the need for an external data collection system outside of VESTA has been almost completely eliminated! Every VESTA comes with a 2 year warranty and a 10 year on the standard. VESTA gets more powerful with each one sold. Customer feedback is always phenomenal. In fact, we have had many customers work with us to achieve this goal and our engineers are excited to make modifications to satisfy any additional customer requirements! For those who need to test meters equipped with Turtle modules, good news, VESTA can now do this as well! In addition to the changes listed above, we are also working on MultiSpeak which will help our Municipal and Cooperative customers communicate with their various billing systems. Built into VESTA is a configurable file export option which allows the user to create custom export files for their use. We have also created several custom export files to help get data where needed. Want to learn more? Call us at 803-628-0035 and ask for Bill, Bree or Maria. We are here to help! Call us today!